IDino Melaye announced his return to the Peoples Democratic Party (PDP) in a video released on Friday night. Melaye was elected to the house of representatives under the platform of the PDP in 2007 but he joined the ruling All Progressives Congress (APC) in the buildup to the 2015 elections. The lawmaker was actively involved in the presidential campaign of the then opposition party. He fell out with the APC after a disagreement with Yahaya Bello, governor of Kogi state but the situation reached its height when the police arrested him in May. When he returned to the senate after different court cases, he opted to sit among PDP lawmakers. 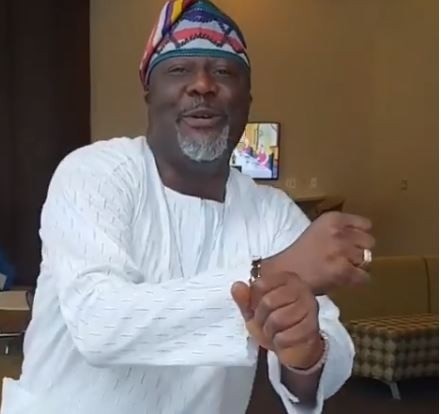 In the video currently in circulation, Melaye danced as he taunted the ruling party. “PDP! Oh my home, oh my home, oh my home, when shall I see my home? “When shall I see my PDP, I will never forget my home,” he sang.